•Colors are painted on the back of the tile so it will not scratch or chip off. Add a touch of nature with a modern twist to any room with the Bamboo Grey tile mosaic. Featuring the recognizable bamboo pattern in a range of charcol grey hues, this tile mosaic perfectly fuses classic shape with modern colors. 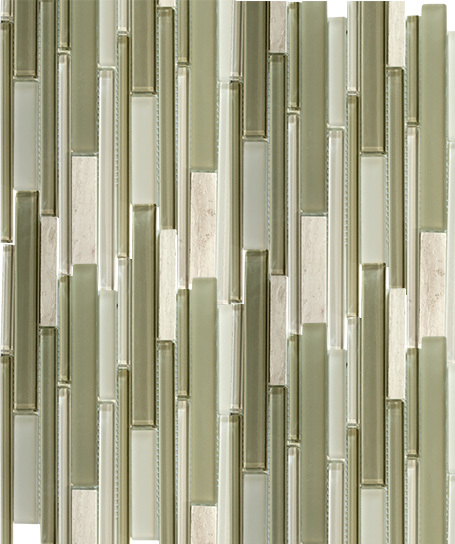 This mosaic is comprised of both glass and stone tiles, both of which work in perfect harmony in this sleek pattern. The combination of these two elements means that this tile will become a beautiful addition to any room of your home, whether it be used as a back splash in your kitchen, on the walls of your bathroom, or even as an accent wall on your patio. Durable and easy to clean, you can't go wrong with this luxe mosaic. Q: what is the size of the piece I would be ordering for just under $8? A: The size would be a half sheet. We apologize for the late response, a glitch occurred in our Q&A system. We appreciate your patience.